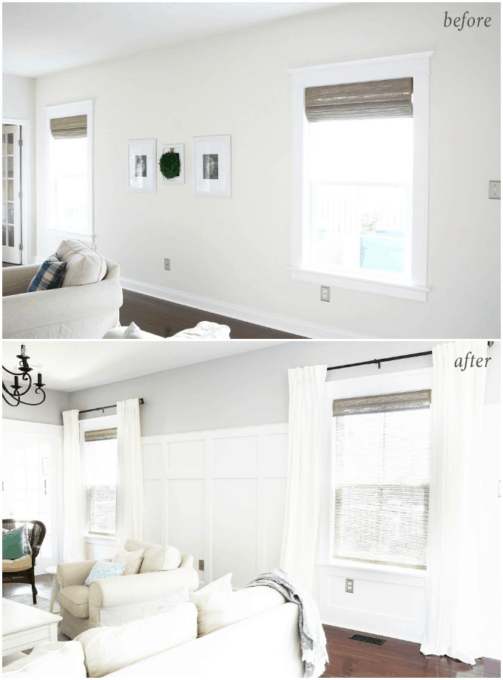 We added character to our builder basic living room by installing a board and batten wall treatment! 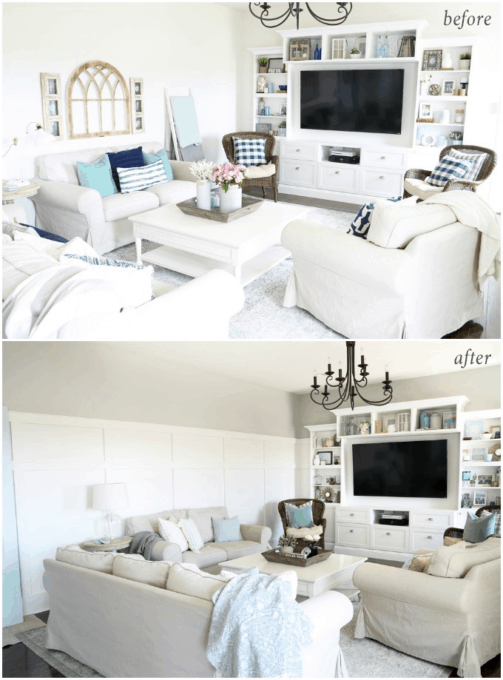 We’ll walk you through the DIY tutorial step by step– it’s easier than you think! Of all of the rooms in our house, the living room is the one that has been the most intimidating to me when it comes to decorating. It started out as this big, blank white box and was just empty! It was getting better, but it still needed a little something. I had known that I wanted to put a board and batten treatment on the walls almost as soon as we moved in. We built our house with a community builder (It’s the Palermo model by Ryan Homes.) so it started out pretty generic, and I knew that board and batten would be a great way to add some of that character that we were craving. But getting situated in a new house takes time and comes with a lot of projects, so putting up board and batten wasn’t exactly at the tippy top of the priority list. But now that we’ve completed some of our highest priority projects (like the boys’ room, the kitchen, and my office! 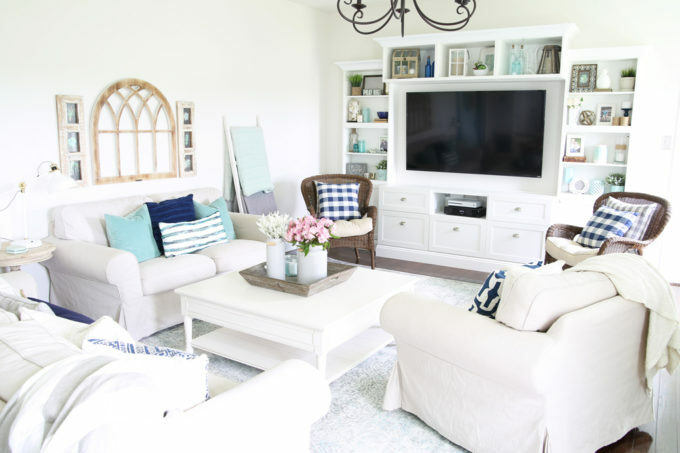 ), we finally made time to get around to the board and batten in the living room, and I could not be more thrilled! This post contains affiliate links. For more information, see my disclosures here. 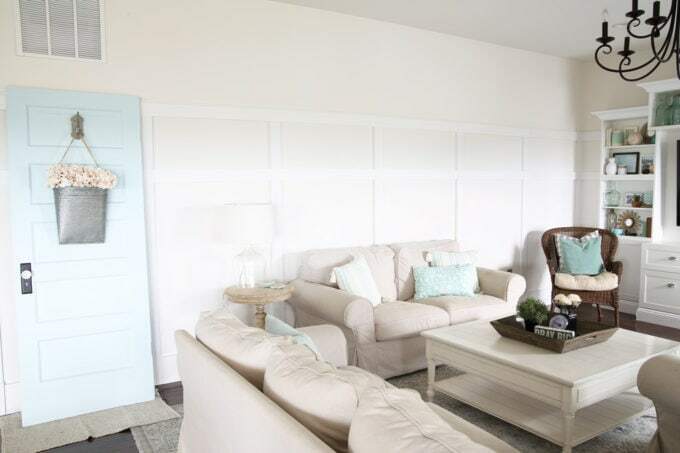 Before I dive in to the process, I feel like I should mention that ours is actually a “faux” board and batten treatment, meaning that we used the wall as our base rather than putting flat boards over the wall and placing the “batten” over top. Since our walls are not textured, this worked just fine for us and was much easier than adding an extra layer. 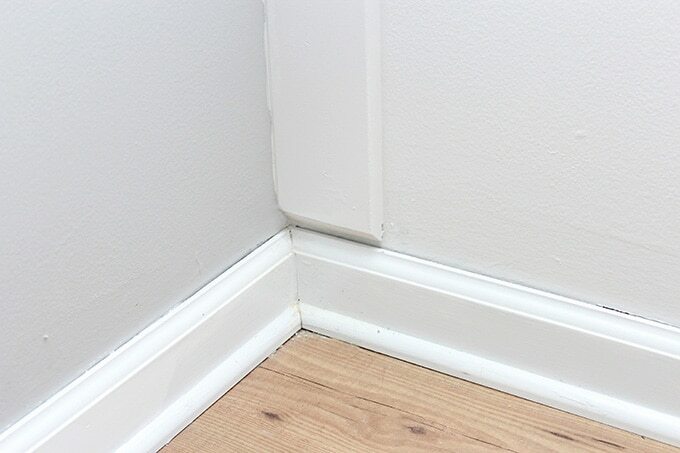 Should I use the existing baseboards or rip them out? One of the first things we had to decide was if we would use the existing baseboards or rip them out and put in new ones. 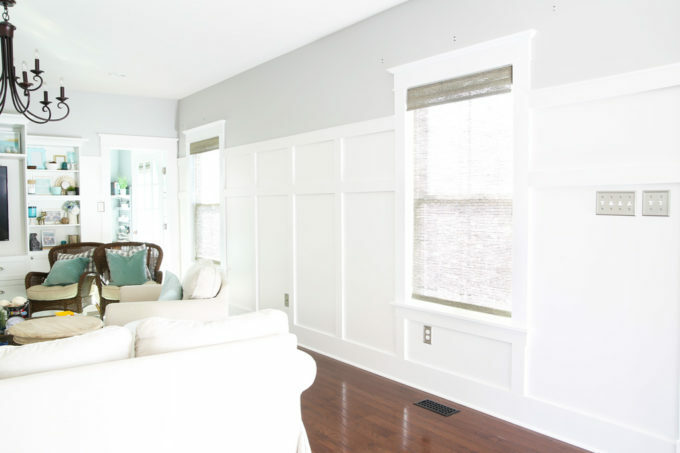 We didn’t mind the look of our previous baseboards, but since they were narrower than the vertical boards we would be attaching to the wall, the vertical boards would hang over the top rather than butting up against them neatly. 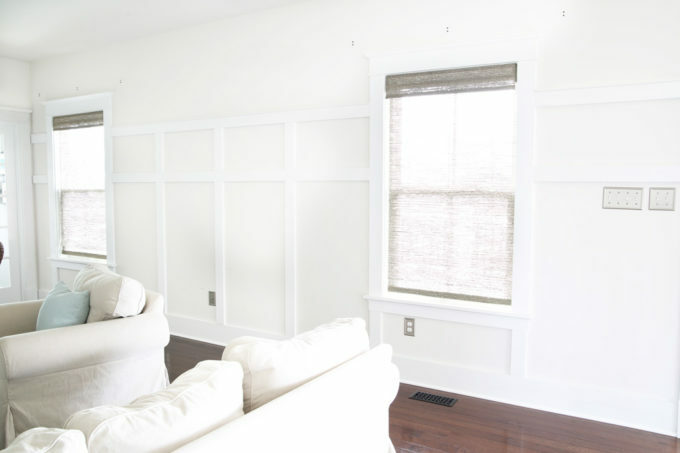 We addressed this issue on the board and batten wall in our townhouse bedroom by cutting the bottom of the vertical boards at an angle so they wouldn’t look as blunt hanging over the baseboard. In that situation, though, most of the vertical boards were behind pieces of furniture, so our little “hack” wasn’t obvious. 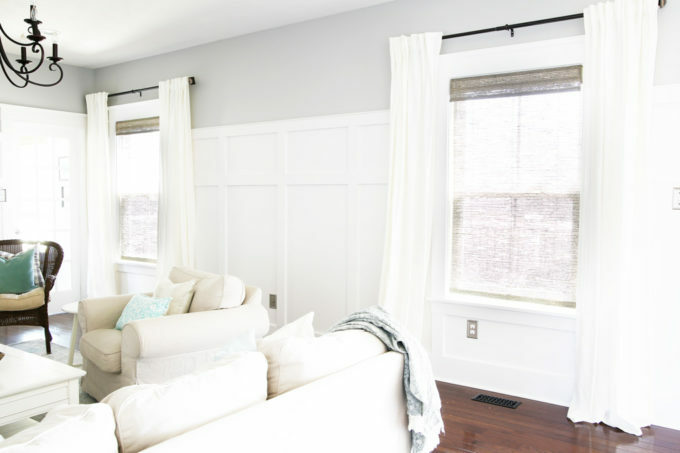 In our current living room where it would be easier to see the intersection of the vertical boards and the baseboard, though, we decided to rip out the existing baseboards and use much taller craftsman style baseboards from WindsorOne. These baseboards were more square than our previous ones, allowing the vertical board to rest perfectly against the baseboard. Once we removed the existing baseboards and added the new ones, we could start installing the board and batten. Which types of boards should I use? For all of the board and batten trim, we decided to use standard 1×4 primed flat stock. This can be found at just about any home improvement store or lumberyard. We felt it was the perfect width for the look we were going for. Along with the flat stock, we topped off the highest horizontal row with a header stop trim piece from Windsor One to create a little ledge and make it looked more finished. We attached this piece with wood glue and 1/2″ brads. How high should my board and batten be? This is more of a personal preference, but I’m happy to share the thought process we went through when choosing the height of our board and batten. While we were thinking about the placement of the upper horizontal board, we also had to think about the placement of the lower horizontal board. We ran into some limitations with this lower board because it couldn’t go straight through the area where our light switches were located. After trying many different configurations, the top of the lower horizontal board ended up at 4’10”. What is the best way to attach the boards to the wall? Once we had decided on the height of our horizontal boards, we used a pencil and a level to mark a line all the way around the room. 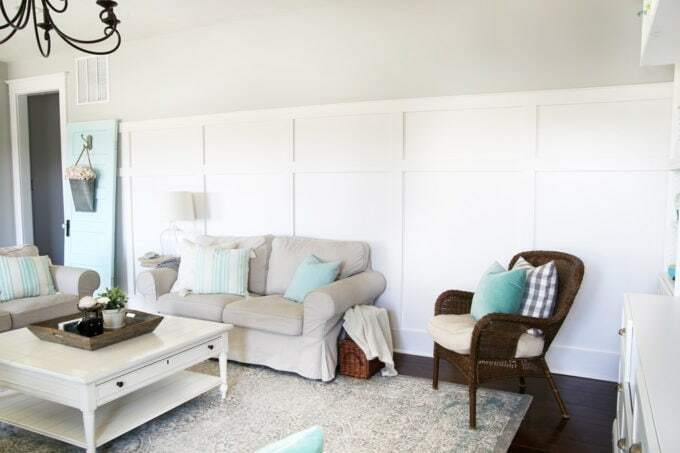 Donnie installed both horizontal rows with a brad nailer, making sure he found many studs, and used wood glue and a mitered cut to join two boards together when one board wasn’t long enough to stretch the length of the wall. The vertical rows were then attached using the brad nailer as well. How far apart should I space my vertical boards? 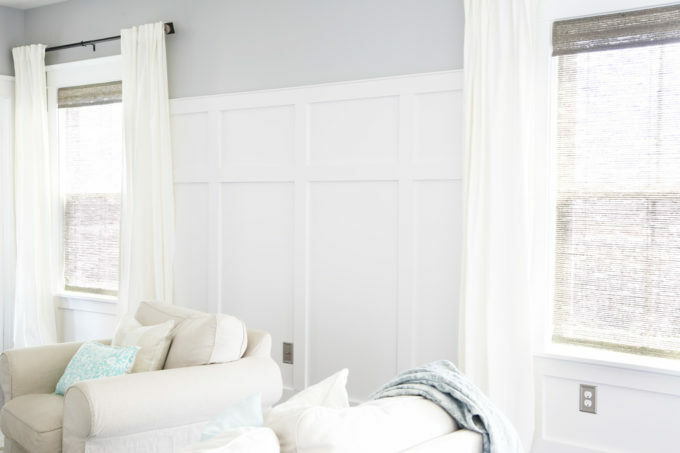 Spacing the vertical boards can be a little tricky because there are typically several “obstacles” that you have to account for– windows, outlets, cable hookups, and other things that may get in the way. After all of my boards are in place, what do I have to do to get them ready to be painted? 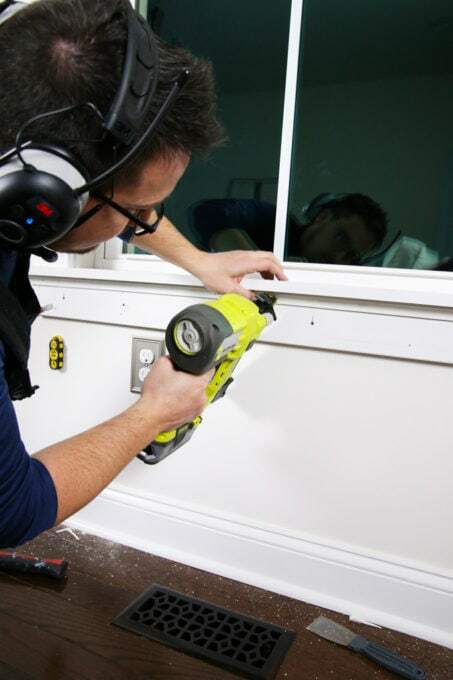 Once all of the boards were installed, Donnie used spackling to fill in nail holes and any gaps larger than 1/8″. After the spackling had dried, he lightly sanded it and then used caulking to fill the small gaps and the areas where the boards butted up against the wall. Then we were ready for paint! We have always done all of our painting ourselves, but we were bringing in a painter to paint our stairwell (which is high and very scary and would have probably sent me to the ER with broken limbs if I had tried to paint it myself 😬 ) anyway, so we had him paint the living room and kitchen while he was at it, and he did an amazing job! 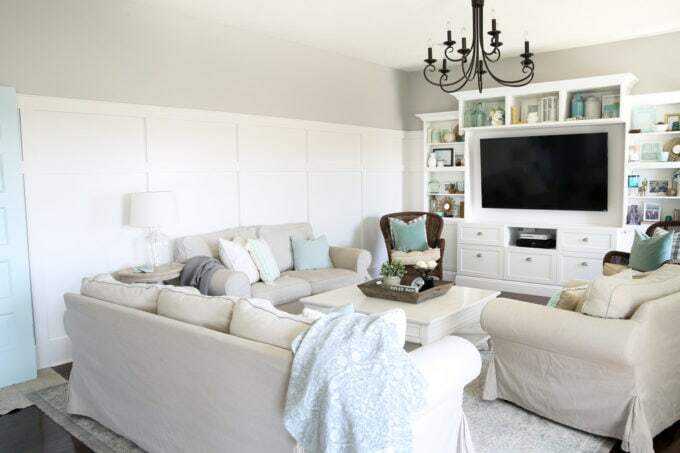 My friends at Behr were kind enough to provide my favorite paint for this project– the top of the space is Behr Marquee Silver City in an eggshell finish, and the bottom is Behr Marquee Cameo White in a satin finish. I finally feel like the room has lost the stark, bare look that it always had before and is starting to feel more cozy and welcoming! I still need to add some wall decor and little accessories, but this space is very nearly finished! Woohoo! Yippee! I’m interested to hear if you’ve ever taken on a board and batten project! If you have any additional tips or tricks to add, please share in the comments below! Get 200+ pages of free printables! Become one of our VIP newsletter subscribers and gain access to our exclusive free printables vault! Looks amazing! 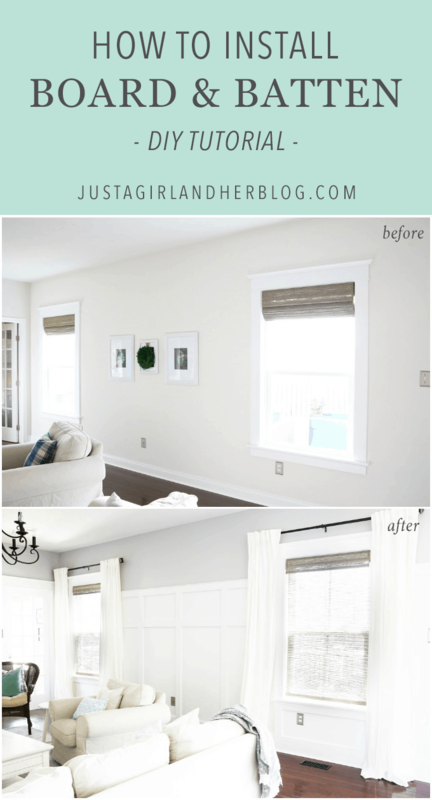 I’m curious if you have plans on making the baseboard in the rest of the house match? Maybe I am just too type A but that has been my biggest hurdle to doing this in my laundry space. 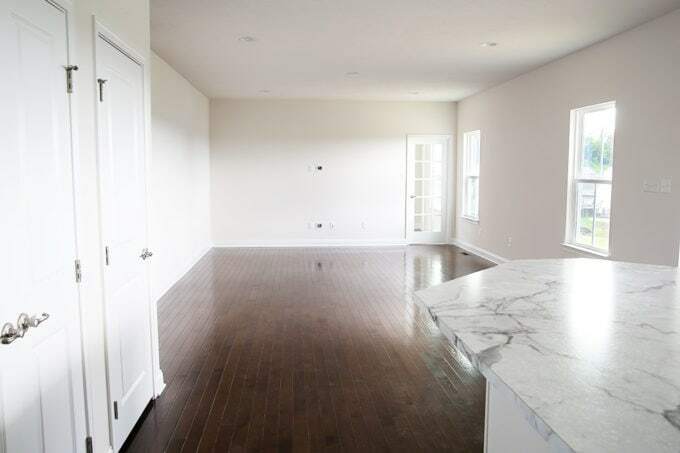 I can’t get over the fact that it would mean *having* to replace the rest of the baseboards in the house to match in my mind! We are planning on doing all of them eventually, but we’re not in a hurry at this point. We know we’ll get there, but there are other projects that are higher on the priority list. We’re not planning on moving any time soon, though, so we’ve got plenty of time! 🙂 Hope you have a wonderful weekend, Janet!